WASHINGTON (Reuters) - U.S. national security adviser John Bolton has vowed to further intensify the Trump administration's tough approach to China, saying Beijing's "behaviour needs to be adjusted in the trade area, in the international, military and political areas." Speaking in a radio interview on the Hugh Hewitt Show recorded on Thursday and aired on Friday, Bolton said President Donald Trump believed China had taken advantage of the international order for far too long and not enough Americans had stood up to it. "Now's the time to do it" he said. Bolton said Trump's tough approach towards China, a country the administration saw as the "major issue this century," had left Beijing "confused." "They've never seen an American president this tough before. I think their behaviour needs to be adjusted in the trade area, in the international, military and political areas, in a whole range of areas," he said. "Perhaps we'll see at the G20 meeting in Argentina next month Xi Jinping willing to come to talk turkey on some of these issues," he added. Bolton's remarks came amid a series of administration broadsides against China that goes beyond a trade war. These have included accusing Beijing of trying to undermine Trump ahead of next month's congressional elections and of taking reckless military actions in the South China Sea. U.S. Treasury Secretary Steven Mnuchin said on Friday Trump would go through with plans to meet Xi at the G20 summit if it looked possible to chart "a positive direction." But he said re-launching trade talks with China would require Beijing to commit to taking action on structural reforms to its economy. 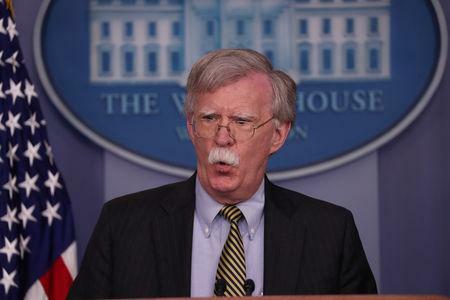 Bolton called recent Chinese behaviour in the South China Sea, where a U.S. warship had a near collision with a Chinese vessel last month, "dangerous" and said the United States was determined to keep international sea lanes open. "This is something the Chinese need to understand," he said, adding that allies including Britain and Australia were also sailing through the South China Sea to make this point. "We're going to do a lot more on that," he said. "I think we could see more exploitation of mineral resources in the South China Sea with or without Chinese cooperation. They need to know they have not achieved a fait accompli here. This is not a Chinese province and will not be." Bolton said China's violation of international norms in trade and business had allowed it to gain substantial economic and military strength. "If they're put back in the proper place they would be if they weren't allowed to steal our technology, their military capabilities would be substantially reduced. And a lot of the tensions we see caused by China would be reduced," Bolton said. "We did this and continue to do it in terms of dual-use technology that could affect nuclear, chemical or biological weapons or ballistic-missile development. "I think in cyberspace, we're entitled to do the same thing ... We want to do it in ways that protect our open economy, but deny others the ability to take advantage of it." Bolton said he expected a second summit between Trump and North Korean leader Kim Jong Un "sometime in the next couple of months," but said it remained to be seen if the diplomatic effort to persuade Pyongyang to give up its nuclear weapons would be successful. "The president has held the door open for North Korea," he said. "They need to denuclearize completely and irreversibly. And if they do that and walk through the door, the future could be very different for the North Korean people. "The future remains uncertain on the president's diplomacy. He's optimistic. He presses hard. He does not have stars in his eyes about this. Neither does Mike Pompeo, neither does Jim Mattis, neither do I," Bolton said, referring to the U.S. secretaries of defence and state.